Brihaspati is the Hindu god who rules Thursdays. 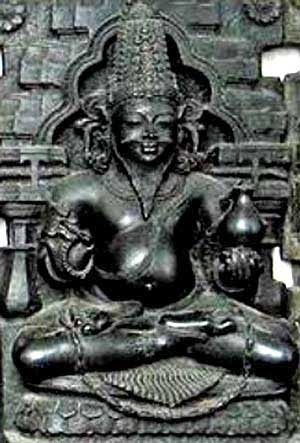 Brihaspati, is the planet Jupiter in astrology, and is the Guru of the Devas or demigods. The word Brihaspati means the ‘Lord of Prayers.’ As per Indian astrology, Brihaspati is associated with mathematics and science and logic. He is the giver of fortune, good luck and fame. Puranas contains many stories in which Brihaspati performed yagnas that help the Devas to fight the Asuras and defeat them. The yagnas and logic provided Brishpati help Devas win many battles. Whenever there was a difference of opinion between the Devas and Brihaspati and when He deserted them, Devas faced defeat. As per Shiva Puran, He is the son of Angirasa Rishi (one of the saptrishis) and Suroopa. Brihaspati has a yellow complexion, wears a yellow garland and yellow cloths. He has four arms that hold a dand of saints, a mala of Rudraksha beads, a bowl and the fourth hand is in Varamudra. Brihaspati is depicted as riding an elephant. His position in horoscope is considered highly auspicious and rewarding. He stays in a person’s horoscope for 16 years. The auspicious day to propitiate him is Thursday. Another day is the Amavasya or no moon day. The ideal way to propitiate Brihaspati is by donating cloths and food.